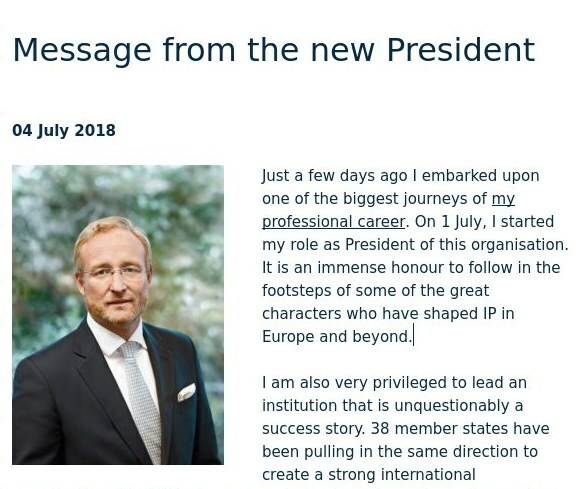 THE NEW EPO PRESIDENT HAS JUST (one hour ago) completed the last working day of his second week in Office. He’s up there in the top floor with Raimund Lutz, Željko Topić and other people from so-called ‘Team Battistelli’, enjoying a penthouse with a bar (built secretly by Battistelli using undisclosed budget). Is the ‘new’ EPO any more transparent than the ‘last’ or the ‘old’ one (before EPO workers greeted each other “happy new year”)? Not really. There’s no indication of it. Some people posted comments on the blog post of António Campinos, but these never showed up. They went right into an abyss. Campinos has since then made the “Comments” count vanish (see before and after screenshots at the top). So in a sense they merely decreased public participation (or an impression thereof). As we said a week ago, blog posts or words aren't enough to mend/heal the wounds. Campinos needs to actually initiate some action/s. Is he open to public consultation? Staff consultation? No comments have shown up in his first (and sole) blog post, so it was an effective as a “contact us” form, not actual commenting from the public. Welcome Mr. Campinos, the new boss, same as the old boss, Mr. Battistelli. 1 – since the ILO-AT judgment which foresaw IMMEDIATE reinstatement of Mrs Weaver and Mr Brumme, to this very date (09.07.2018 at 18:52) NOTHING concrete has been done by Mrs Bergot, Principal Director HR who is vastly responsible for the social chaos at EPO, to execute the unambiguous judgment. 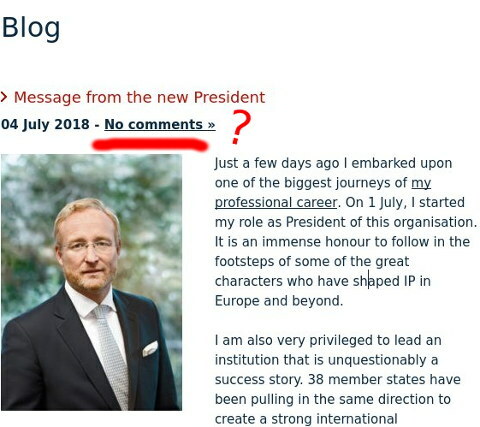 2 – since his arrival at EPO one week ago, Mr Campinos has NO officially contacted (much less invited) staff reps and/or unions (but he started right away by circumventing them whilst meeting with “staff” directly (only a few of them and which one is unclear). For someone who has been elected on a “social” mandate this is quite disappointing. Future will soon tell if this changes for the better but since one has only one chance to make a first impression, the least that one can say is that Mr Campinos first impression is not impressive. I do not like the sound of this. Under his predecessor, cooperation has become an equivalent for transferring money to the small contracting states in exchange for unwavering support against all odds. No supervision at all, no accountability whatsoever. I guess Sepp Blatter was good at cooperation, too. The show must go on, only the croupier’s name changes. The Tribunal validated as “balanced” the temporary composition of the Appeals Committee between 1 January and 30 June 2017, which was relied upon in light of the CSC’s refusal to appoint members of the Appeals Committee (Judgment 4049). The Tribunal noted that two out of four members of the Appeals Committee were chosen “[b]y way of exception” among eligible staff members in the pool of staff representatives and that the composition was thus in accordance with the relevant provisions “which are not ambiguous”. The ILOAT’s judgment in this regard will bring stability for the Office’s internal means of redress which operate under the authority of external Chair and Vice-Chairs since October 2017. Wherever relevant medical issues are identified during a disciplinary procedure, the Tribunal clarified the duty of the Disciplinary Committee to order a medical assessment and determine its scope. The Tribunal also stressed the duty of staff to cooperate with medical proceedings, which is the counterpart to the Office’s duty of care, and that in instances where a staff member refuses to undergo a required medical examination or to provide relevant medical background information, “the examination can be undertaken on the basis of documents, if necessary.” (Judgment 3989, consideration 4; cf. Judgment 3986, consideration 8). In sum, the EPO-related judgments should be taken as a reminder of the need for the administration and all staff members to work together to enter into a constructive social dialogue and, in case of litigation, ensure the functioning of the legal protection of staff through an efficient system of internal and external means of redress. Märpel thinks that Mr Germond wishes for “the administration and all staff members to work together ” seem to forget that the it is the administration that dismissed staff members even when the appeal committee gave a positive opinion. He also seem to forget that the same administration created a new investigation unit with vast powers and absolutely no normative control. Last but not least, he also forgets that the same administration later modified the internal means of redress several times until they practically gave the administration 100% success. The reason we’ve been attracted to EPO scandals is the sheer abundance of them. It’s a magnet of abuse, just like the UPC lobby, which we dubbed “Team UPC”. Yesterday we wrote about Team UPC's spin regarding the short statement from the British government — one that’s now being covered by World Trademark Review (“”No closer to clarity” – UK’s Brexit White Paper offers clues to future IP approach, but big questions remain”) and by Edward Nodder (Bristows) with that word “confirms” again (only hours ago). He said that in relation to something which boils down to a lie or intentional misinformation. Bristows LLP has been marketing these ‘unitary’ patents for a number of years; it may have lots of explaining to do, e.g. to clients, if this advice was all for a bogus idea, just like those bogus job openings it kept advertising (the EPO is doing the same thing right now). EPO Abuses Against People With Disabilities Followed by Legal Bullying?